The U.S. Open is kicking off at Chambers Bay this week. With an average resale price of $237 (and climbing) for a grounds ticket for Sunday’s final round, this year’s U.S. Open currently has the most expensive final day in at least five years. There is even more stark of a difference when this year is compared to last year’s U.S. Open, held at Pinehurst in North Carolina. A ticket to the gallery for the final round last year cost just $95, which is 2.5 times less than a gallery ticket for Sunday is costing this year. With gallery tickets to Sunday’s final round sold out, the average ticket on the secondary market is going for nearly twice the face value of the ticket, which is $125. The cheapest day to attend the tournament is Thursday, when the average galley ticket is reselling for only $148. Friday’s round is going for an average of $187, and Saturday’s will cost $216 a ticket. 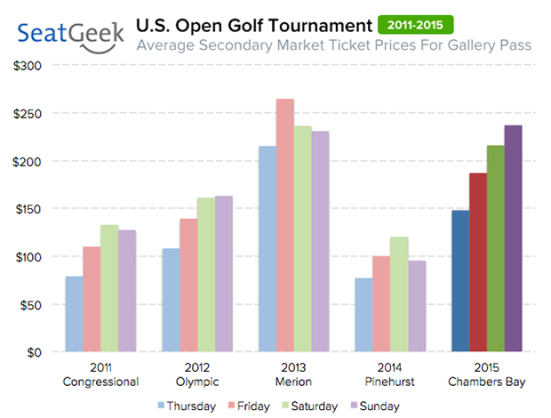 While ticket prices overall are up significantly from 2014, they are actually down from the 2013 U.S. Open at Merion Golf Club in Pennsylvania. The average price per day for a gallery ticket was $237 during the 2013 Open, where as this year it is only $197. Oddly enough, the most expensive day to attend at the 2013 Open was actually Friday, when the average ticket resold for $265.